I hope this will be my first of several posts about how to “can” and preserve fresh foods when they are in season. I am a beginner canner myself, but have always been intrigued by and interested in the whole process. So I recently took a “Canning Class” (led by Ashley Eller at Poplar Ridge Farm) and have also been reading through some other resources including the Ball Blue Book Guide to Preserving. Prior to my class I knew absolutely nothing about canning except that I thought it sounded confusing, complicated, and like something that would take an entire day to do (not true!). It is important to use canning recipes from reliable sources. Especially as a beginner these are not recipes you want to modify or adapt in any way because each ingredient as well as both the length of time and temperature at which the jars are processed can be key components to ensuring food safety. You must use jars that are in fact suitable for “canning” with two-piece metal lids, which does not include old washed out Ragu spaghetti sauce jars. The most widely used brands of jars for canning are Ball and Kerr, and while the jars and bands (that go around the lid) are reusable you must always use brand new lids to properly can foods. Now I know why I see those packs of lids for sale. It is necessary to sterilize the jars and lids before pouring in your jam (or other recipe). You can do this in hot water (180 degrees F), or if you can time things right run the jars and lids/bands through the dishwasher so they are hot and ready right when your recipes are done. According to the Ball Blue Book Guide to Canning to process high-acid foods like berries and tomatoes you simply boil them (in the jars), but you actually need to pressure can low-acid foods like asparagus, peas, and corn. So my personal plan is just to stick to the high-acid produce for a while until I really get the hang of things. If you aren’t sure if your foods “canned” properly your nose and/or a quick taste test should confirm whether a jar spoiled or not when you open it. You certainly can spend your entire day preparing big batches of recipes in order to preserve in-season produce when it’s fresh, but it does not have to be a huge production. 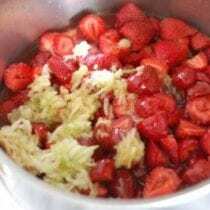 In fact, I made a small batch (half the recipe) of the strawberry jam posted below in just over an hour…and I am a newbie. Please share your canning tips in the comments below…I know some of you have been doing this for many years! Ball Utensil Set – This set includes a jar funnel, jar lifter, lid lifter, and bubble remover/headspace tool. I found the first three of these items to be invaluable, although I could probably live without the bubble remover/headspace tool (for now). A large pot – You’ll need one big enough to hold several sealed jars that could be covered with 1 – 2 inches of water. 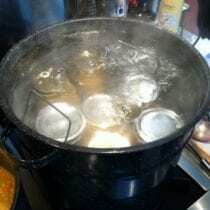 This does not have to be a “canning” pot (sometimes called a water bath canner)…any big old stockpot will do. A ladle – This is necessary to get your jam (or whatever you are making) from the pot to the jar. A digital or analog scale – Some recipes call for ingredients in weight measurements, but not all. I have an extremely basic analog scale and to be honest it totally does the trick. Potato masher – This was a necessary tool in order to turn my cooked strawberries into yummy, mushy jam. Basic thermometer – To test the temperature of the water before sterilizing jars/lids. Canning rack – This is to lower the jars into and out of the boiling water when you are processing them and to provide space between the bottom of the jars and the pot (you can use other things like jar bands, silverware or even a dish towel to create that space). I don’t personally have one and I survived, but I can see the value if you are going to be doing a lot of canning. Just make sure the size you buy fits your pot if you aren’t getting a set! Dissolvable labels – I seriously love these things, but if you can’t justify the expense some regular old masking tape will definitely get the job done. Pressure canner – As I mentioned above I don’t see myself “pressure canning” anytime soon, but if you want to preserve low-acid veggies then this is a necessary piece of equipment. Follow homemade jam recipe (as stated below). While it’s cooking sterilize the jars and lids/bands in hot water. Ladle the completed jam into hot, freshly sterilized jars one-by-one. Add jar lid to the top while keeping the inside sterilized. Screw on the bands and add jars to boiling water for 10 minutes. Recipe from Ashley Eller with Sweetie Pie Bakery. This sugar-free jam is sure to please! 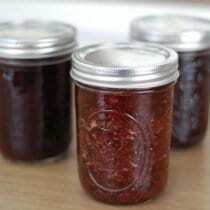 Make Jam: Rinse the berries and remove any spoiled or severely blemished ones. Hull strawberries and slice in half. Mash the fruit with a potato masher once the fruit begins to soften. If foam forms on top of the fruit you can skim with a metal spoon and discard if desired. Prepare Sterile Jars: Meanwhile fill the canning pot ¾ full with water, cover, and bring to a boil over high heat. If you don't have your jars sterilizing in a hot dishwasher you can use this pot of water to sterilize them. Also start a small pot of boiling water to sterilize the lids separately. Be sure to wash all jar pieces in hot soapy water first. Once the water is boiling turn off the heat. Test the temperature with your thermometer and when it reaches 180 degrees F put the jars and bands in the large pot and the lids in the small pot. Leave everything in the hot water until ready for use, removing one at a time as needed. 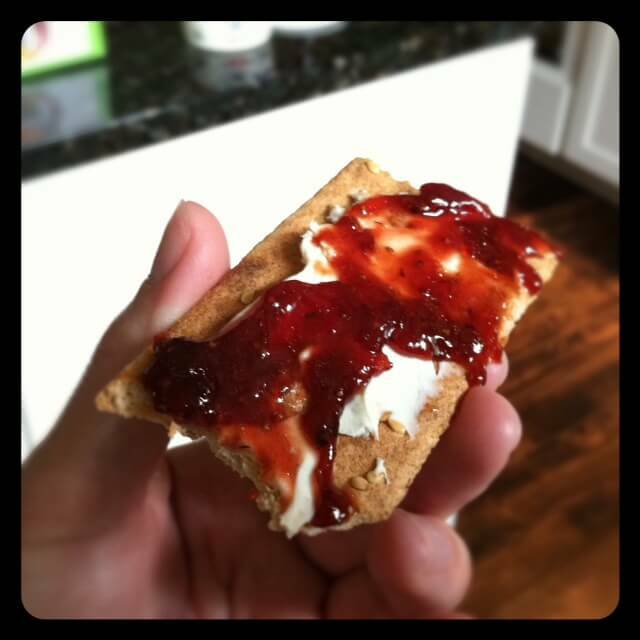 When the jam is done cooking do a taste test to make sure the thickness and flavor is to your liking. Hint from Ashley: Drop dots of jam on a cold plate, if it seems to set up, it is done. You can also see if it coats the back of a spoon. Remove the first jar from the hot water using your jar lifter tool and shake out excess water. Don't touch inside of the jar in order to keep it sterilized. Insert clean canning funnel and ladle the hot jam into the hot jar leaving ¼ inch headspace at the top (this is where the headspace tool can come in handy - leaving more space at the top might not give as good of a seal). If there are any air bubbles you can slide a clean knife along the inside of the jar to remove them. Using a clean rag wipe excess off the outside of the jar and rim. 8Using a magnetic lid lifter pull the first lid out of the hot water and set on top of the jar without touching the bottom of it. Then while only touching the outside of the band screw it onto the jar just firmly enough so it doesn't feel wobbly on the grooves. Repeat until all jars are filled. Note (If you don’t want to actually “can” the jam): You could stop here and refrigerate jam for 3 – 4 weeks. To freeze the jam make sure you used freezer-safe jars, (Ball makes plastic jars for this purpose), leave at least a half an inch of space for expansion, allow the jam to completely cool, and put in freezer for up to one year. One additional tip for freezer jam is by placing a round of parchment paper on top of the jam, you can prevent ice crystals from forming. Process the Jars: Bring large pot of water back to a boil. Using your jar lifter (or canning rack) carefully lower as many jars that will fit without overcrowding into the boiling water so they are covered by at least 1 - 2 inches of water. It is recommended that the jars do not directly touch the bottom of the pot (so hot water can flow beneath them) and some even suggest putting a dish towel on the bottom to create space. From the moment the water is boiling and the entire first batch of jars are submerged set the timer and process them for 10 minutes. When 10 minutes is over use the jar lifter to carefully remove the jars from the water. Put them on the counter and don't move them right away. You will hear your jar lids "popping" which means they have been sealed properly. If jars aren't sealed within 12 hours then move them to the fridge and eat within 3 - 4 weeks. Remove bands from sealed jars and with a clean, wet cloth wipe off any jam that has congealed on the outside rim of the jar. This prevents mold from forming on the band. The band can be reapplied, but don’t screw them on too tightly. Label jar and store in a cool, dry, dark place for up to 1 year. You can optionally add in arrowroot powder or chia seeds as a way to thicken the jam. If you like jams with crunch, opt for the chia seed addition! 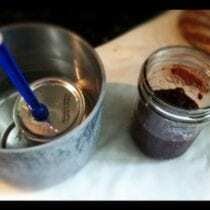 I was wondering too about how you did grape jam with grapes and honey? It’s well known that honey shouldn’t be boiled cause it becomes toxic.What do you think about that? Hi, can I half this recipe? I have all of the ingredients and Im ready to cook, but I didn’t know if that was possible. I read above that it might not be safe to half it. I did some research first and I found that people said to do grapes in smaller batches. I bought the dark red grapes (organic & seedless) that almost look black. I used about 1 bag.. might have been 1-2lbs. It made 4- 8oz jars of jam. I put it all in a pot and brought to a boil and mashed the grapes with a potato masher. After it was done simmering I put it all in a blender and blended it up really well skins and all. Then I put it back into the pot and brought it back to a boil and let it simmer maybe 20 more min. I really do not want to can. Can I just make the jam and put it in freezer bags and thaw when I need to? Hi Amy. You can. You can also freeze in mason jars. I would think boiling up the honey would be slightly better than white sugar (but not much. What do you do if you need a low carb solution. David, just use raw honey. Contrary to popular belief, honey in the raw will not raise your blood sugar, and the body uses raw honey as energy, and when spreading this Strawberry Honey Jam over some 100% whole grain bread with the fiber in tact, you will have a slow digestion for the optimal energy, and the calories are burned, so long you are active. In place of honey, you can also use coconut sugar. Just use the same ratio 1:1 of the coconut sugar as you would the honey. Lastly David, don’t worry about the calories, worry about eating Good Fats, Protein, and Complex Carbohydrates, and if you are an active individual, you will burn the calories. Lisa what a great explanation about canning. I grew up with a yard ull of fruit trees, from peaches, nectarines, to figs and pomegranates. My mother was canning all summer long. You mention in your article that your Strawberry Honey Jam was not as thick as store bought jams? The reason why is you are not using pectin, which thickens the fruit, along with the sugar used. Hi Randy. Lisa typically buys raw local honey. I really appreciate finding an easy jam recipe that doesn’t use sugar! I’ve made batches of jam several times. Because of crohns I stay on a specific carbohydrate diet, it means I can’t digest sugar or pectin, honey is acceptable b/c it’s a monosaccaride. 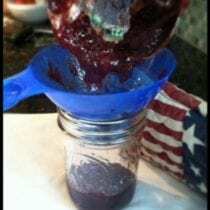 I use knox gelatine to add some body to my jam recipe ( still a little looser than store bought sugar laden jam though! Thought I’d share that tip for those trying to avoid pectin! Mine came out pretty runny. Any suggestions to thicken? Hi Karmin. It is not thick like a regular jelly because pectin is not used. What kind of apple does everyone prefer for this recipe? I would think a granny smith might be too tart. Hi Gabrielle. I think frozen will work, too. Other readers have used frozen berries. Do you know how many pounds of strawberries are in a gallon? I want to make sure I use the right amount of berries for the recipe. Thank you! 1. You need to also leave some room at the top of your cans (called headspace) prior to canning them. Most recipes will specify how much headspace you need to leave. This allows for movement, changes in volume and pressure during the canning process. 2. The sniff/taste test should not be relied upon. While it may let you know if something is spoiled (due to spoilage microorganisms degrading your food), it will not tell you if a product is safe or not to consume. Pathogenic microorganisms will generally cause no observable changes to food – therefore a food item may look fine, but may in fact be contaminated. Foods which have an off-odour, taste or appearance have generally been affected by spoilage microbes (which are non-pathogenic in nature). Therefore, when canning it is extremely important to make sure you use the right temperature and time combination. The main pathogen of concern when it comes to canning is Clostridium botulinum (which can form spores and survive at high temperatures). Consuming even a few of C. botulinum cells or spores can lead to an infection or intoxication which can result in paralysis and even death. Canning is a great way to extend the shelf life of many food items, but make sure you are doing it correctly and safely! Thank you Audrey!! Especially your second point. I cringed when I read about the sniff/taste test. Botulism poisoning is so dangerous! Kuddo’s for your great explanation. Would it be possible to use this recipe to make freezer jam? Hi Lisa. Sure, you can freeze it. This might help, too: http://www.npr.org/templates/story/story.php?storyId=113079746. Especially keep in mind with tomatoes/products. As long as you follow temperature and time it is fine. Tomatoes don’t normally smell/look bad when not done right. I do have a couple questions. Is there a temperature to cook the jam to? How long do you cook? You day when the jam is done, but don’t actually tell us how to get it done. This looks so much easier than making my own pectin with apple peels before making the jam. Thank you! I’m hoping to score some tasty, ripe strawberries at the Farmer’s Market this weekend. If I do, I’ll use your recipe to make the jam. So looking forward to it, as we used up our last jar of homemade months ago. Btw, this is the recipe of the day today on Cooking with Whole Grains & Real, Whole Foods on Facebook. Thank you for sharing this! 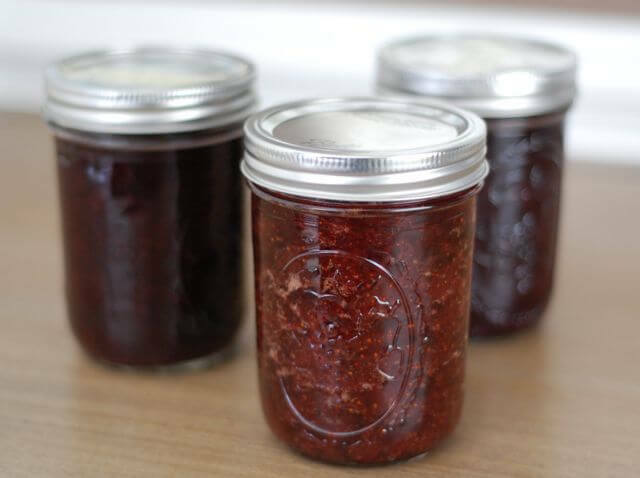 I have been canning strawberry jam for the past 2 seasons (with pectin and sugar), and since I started my quest to eat clean, I have struggled with the idea of giving up my jam but now I don’t have to! I cannot wait for the strawberries to be ready, still a little ways to go here in New England! This might sound like a dumb question but can you taste the apple in the jam? I really want to convert to a healthier recipe but have picky eaters. Also since you leave on the peel is that noticable in the jam? Thanks! Hi Gwyn. No and no. :) And, it is not a dumb question. You can’t taste the apple, but the honey was way overbearing. I suggest adding maybe 2 1/2 – 2 3/4 cups of honey to start out with. You can add more, but you can’t take it away. Or maybe try the last cup of sugar instead of honey. My husband is the sweetest tooth I’ve met and even he won’t eat it until I ‘fix it’. Gwyn, you can’t taste the apple, but for me the honey was way too strong. If you have picky eaters I would start with less honey and see how it tastes. You always add more. You can’t take it away. Hi! What kind of apples are best? Hi Dana. Lisa uses granny smith. Thank you for sharing this no-pectin recipe! Hopefully, I will be able to can some strawberries this year. I have not actually canned anything- yet. I am looking forward to it, though! Hello! Has anyone tried using maple syrup instead of honey? I am making a batch now but it is very liquidy. Just wondering if I need to add more syrup. I see a few people mentioning that the honey is overpowering, and cutting back. Will that affect the acidity of the recipe and change the safety of it? Hi Ronica. We’ve not tried making those changes so we can’t be sure how it would effect the outcome. Hi there, my daughter cannot have lemon lime or orange juice… what is th purpose of the lemon juice and how would it be with out it or is there a substitute? Hi there. The acid (lemon juice) works with the pectin to help it gel. I read that the “sugar” helps preserve the jam. Also, people used to make their own pectin, from apples. When I called my grandmother when my chokecherry jelly didn’t set up she told me to add apple juice, but make sure it’s 100% juice. Also the reason (besides the wish to get away from processed foods, where the food has become inferior), to use organic (non gmo) honey as sweetener & apples as the pectin is that you don’t have pesticides in your food. I am overjoyed to have found this recipe & can’t wait to try it today! The lemon juice gives it the acidity it requires for keeping the fresh fruit color. Hi. The apples are the natural source of pectin. Trying to convert 6 lbs into cups. Can you help? A converter on line suggest like 10 cups. I don’t own a food scale. I just made this, and it was unreal. Best Jam I have ever made. I had 5 quartz of strawberries, with 2 1/2 cups of honey. The rest of recipe I kept the same. Just turned out amazing! Very happy. I froze mine. When you say you froze yours, did you not do the hot bath at all? Thanks!! I love freezer jam but wasn’t sure if I could do that with this recipe. Just want to mention that boiling the jars and lids is not sterilizing it, it’s disinfecting. It will kill some bacteria, but not even close to all of it and especially not the endospores. If canning, I’d highly suggest using a proper canner since it’s similar to autoclaving, which is a form of sterilization. Anyone tried this version with raspberries? There is nothing in the linked article that suggests that baking or cooking with honey is “harmful”. Heating honey may reduce the minor nutrients slightly, but this is not a staple food, it is a treat, right? Honey still adds lots of flavor, and is a good substitute for refined sugar in cooking and baking. I just need to make a quick comment I am a Master Food preserver, and have home- preserved for years….You NEVER taste home preserved foods you think may have spoiled or failed to seal!! Jams,jellies,fruits may be refrigerated,and may be used,if they fail to seal directly after prosessing( after cooling) .If you haven’t heard the “pop” and the little dome on the lid isn’t down…it isn’t sealed.Remember when in doubt…throw it out! 1 1/2 apples and Lisa uses granny smith for their high pectin. Love to see when people tackle Jam. I have been making jam a long time and use a Product called Pomona’s Pectin. super product that can be purchased online and in my local Health food shop. It uses calcium powder to gel so you can use Honey, sugar, or no sugar at all. “If you aren’t sure if your foods “canned” properly your nose and/or a quick taste test should confirm whether a jar spoiled or not when you open it. ” No, dear. Really, really, no. Well this was a positive and constructive comment! Rather than being rude, offering suggestions from your wealth of personal canning (I’m assuming) would be significantly more helpful. Lynsey, why yes, I do have oodles of canning experience. But, sorry, I can’t think of how to put a positive spin on this. If you are unsure if your jars have been properly processed and sealed, the rule is to throw it away. There is a difference between food spoilage and food poisoning. If you don’t know the difference, contact your nearest home ec teacher or county agent for some help. If you don’t understand the difference you should not be attempting to can your own food. You must be from the Northeastern US. Perhaps New England. As for labeling…I just write on the top of the lid with a marker. You can’t reuse the lid anyway. This articles Title is somewhat misleading. It would be more correct to say “Added Pectin”… Pectin is found natrualy in plants, and is the gelling agent. This recipe adds grated apples as the method to on a chemstry level add Pectin to your berry jam for a proper gel. Although most pectin you purchase as a canning additive is created from Citris fruits and is processed to create it, giving people the idea that Pectin is bad is a bit misleeding. How many of what size jar does a batch or half batch fill? Just need to make sure I have enough jars ready. It makes six pints. Lisa uses 12-8 oz jelly jars. Can I use Stevia instead of honey (I’m not fond of the taste of honey in jams). I have been making freezer jams with basically no sugar and love the taste of ust berries. I know that sugar is required for the pectin to work (whether the pectin is natural or boxed). Plus I am diabetic as well. I read up on this and Stevia is not a good choice of sweetener for many reasons. I’ve been researching this too Hannah. I’m going to try using Pomona’s Universal Pectin to make some strawberry jam. I’m anxious to see how it turns out. Awesome, please post your results! Thank you Lisa for adding canning to this blog! I enjoy canning, but wasn’t sure how to adjust regular canning recipes (like jam) to be healthier without accidentally ruining a whole batch. I’m excited to see more real food canning recipes on this blog! Hello, thanks for sharing the recipe! I am looking forward to trying it out now that strawberries are ripe. I would like to state that the “dishwasher” method is generally not the safest for sterilizing the lids and jars as you cannot monitor the temperatures of the water. Also, spoiled canned goods resulting from a bad seal could contain botulism, something that could turn a “taste test” fatal. I would recommend that you update your blog so that people who don’t know better aren’t at risk of food born illness. I tried this to the T and my jam would not set. I had to go back and re-cook it and add store bought pectin in the end to get it to set. Did anyone else have this problem? Thank you so much for your recipe, I based mine off of yours and some I found in the Ball Home Preserving book. Do you adjust the honey when you have sweeter berries? I’ve found it’s easy to get away with 1 cup of honey instead of 3 3/4 cup. Tried this also with 2 c maple syrup and it did not thicken up to a good jam consistency. I have yet to make this and was wondering if you managed to get a good “Jell” I mean did you use just the one cup of honey with the recipe other wise the same…and how did it turn out? Hi Danielle! Yes it’s jell like thanks to the large apple I added. My recipe was 1/2 flat strawberries, 1 c honey, 2 sliced rhubarb, 1 lemon squeezed, and one whole apple. That’s awesome thank you so much… I’ll be looking for rhubarb now!!!! One more question.. How much Jam did it make? Sorry I’m still new at this and SO EXCITED.. So is my husband..
Is that 1.5 cup of apples because they vary in size and any specific variety? Hi. Lisa uses granny smith. One box of pectin is not enough for this recipe, which is maybe why the Apple didn’t work enough- too big a batch? Also I didn’t see “Granny Smith” until the comments, if that is very important, it should be in the recipe. Huge waste of time, money, and a big mess in my kitchen. I need to choose my battles and I’ve decided to battle sugar, and just eat the dang pectin. You need to let the jam cook down on the stove to thicken. I just made this last night, it is not gel consistency nor is it runny- perfectly in the middle for my liking. HI Lisa, I have your book and am a big fan. I am surprised how much honey is used. I am trying to ween myself from all sweeteners, honey included. Strawberries are so sweet, I assume a sweetener helps the strawberries thicken. If the jam was cooked down long enough would it start to gel without sweetener? I would love for you to experiment with using less or no honey. Thanks! Hi there. We’ve not adjusted the ingredients in this recipe. Let us know if you give it a try. Can you use this recipe for peach jam? Hello. We’ve only used this recipe/method for strawberries. I was wondering if you could tell me why you don’t use pectin? Is it that bad for you? Hi there. Lisa just avoids processed ingredients. The information at the beginning is incorrect. Tomatoes are not considered a high acid food and should have store bought lemon juice or citric acid added to the jars if they are not being pressure canned. Pressure canning is pretty easy with the right equipment! How can you adjust for a smaller batch? You do not need to sterilize jars if you process for 10 minutes. Only clean hot jars are needed. The jars are sterilized during the 10 minute process time. 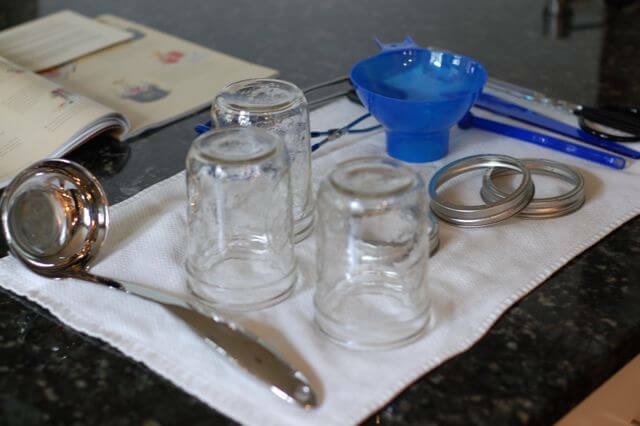 If you use sterilized jars the correct process time is 5 minutes. The is per the National Center for Home Food Preservation. I just watched this amazing lady on you you tube who makes and cans jams from fruit juices. Apparently they come out pretty amazing. Can you tell us who this lady is?! I would love to know. Sorry, we do not have a recipe for a canned apple pie filling. Can this be made with frozen (thawed) strawberries? What happens if you consume stawberry jelly that was improperly sealed, & expired? Thank you for this recipe! I am actually adding a bit of organic rosewater to make strawberry rose jam, but I’ve been hunting a way to get pectin and refined sugar out of it. If your berries are really sweet can you use less honey? Hi I love the recipe I’ll gladly try it. But the optional part adding the arrow root or chia seeds to thicken is that safe to use if your actually canning to preserve the jam for later in the year? Wow this is delicious. It is very sweet in a good way. Personally I’d cut the honey back by about half. But I boiled it for 50 minutes and it came out nice and thick and was extremely flavorful. We will be making it again! I know you said you can put the rings back on loosley, but I have seen other people recommend leaving the rings off completely after your jars have sealed. This keeps a jar from revealing itself after the seal has been broken due to heat or other circumstances.